Anyone else's articulated ideas, arguments, opinions, or experiences. Any artwork, pictures, videos, or other creative works produced by others. Direct quotations of any words written or spoken by others. Unique phrases or terms coined by others. Data, statistics, or facts produced or documented by others. Published research details and results, whether conducted by you or others. You use your own artwork, digital photographs, video, audio, etc. You are using "common knowledge". This can be a little tricky, but a general rule of thumb is: If the majority of people already know the information, then it is "common knowledge". You are using generally-accepted facts, e.g., pollution is bad for the environment, including facts that are accepted within particular discourse communities, e.g., in the field of composition studies, "writing is a process" is a generally-accepted fact. You find the same information not documented in five or more authoritative sources. 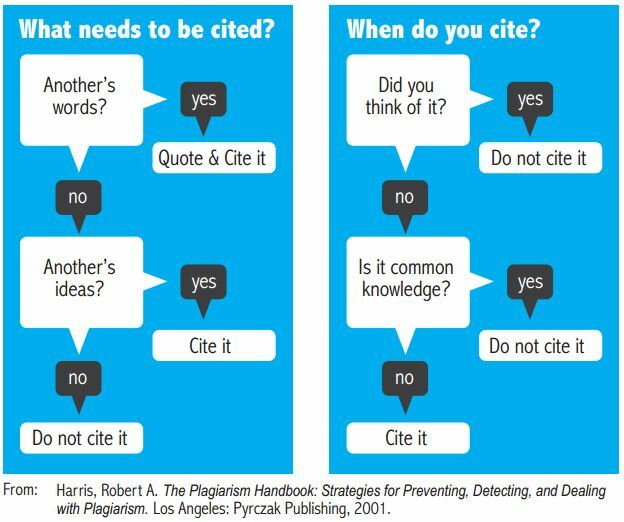 Offers a thorough and up-to-date discussion of plagiarism and the proper use of sources. An in-text or parenthetical citation, which appears within the text of your paper, immediately following a direct quote or paraphrased text.